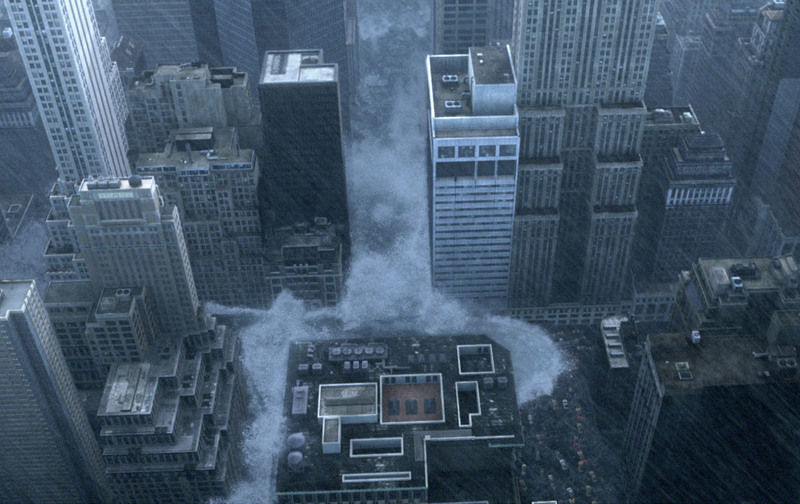 Are Disaster Movies Predicting Our Future? The latest IPCC report suggests that sudden climate catastrophes with irreversible consequences may not be as improbable as we once thought. Not so long ago, it was science fiction. Now, it’s hard science—and that should frighten us all. The latest reports from the prestigious and sober Intergovernmental Panel on Climate Change (IPCC) make increasingly hair-raising reading, suggesting that the planet is approaching possible moments of irreversible damage in a fashion and at a speed that had not been anticipated. Scientists have long worried that climate change will not continue to advance in a “linear” fashion, with the planet getting a little bit hotter most years. Instead, they fear, humanity could someday experience “non-linear” climate shifts (also known as “singularities” or “tipping points”) after which there would be sudden and irreversible change of a catastrophic nature. This was the premise of the 2004 climate-disaster film The Day After Tomorrow. In that movie—most notable for its vivid scenes of a frozen-over New York City—melting polar ice causes a disruption in the North Atlantic Current, which in turn triggers a series of catastrophic storms and disasters. At the time of its release, many knowledgeable scientists derided the film’s premise, insisting that the confluence of events it portrayed was unlikely or simply impossible. 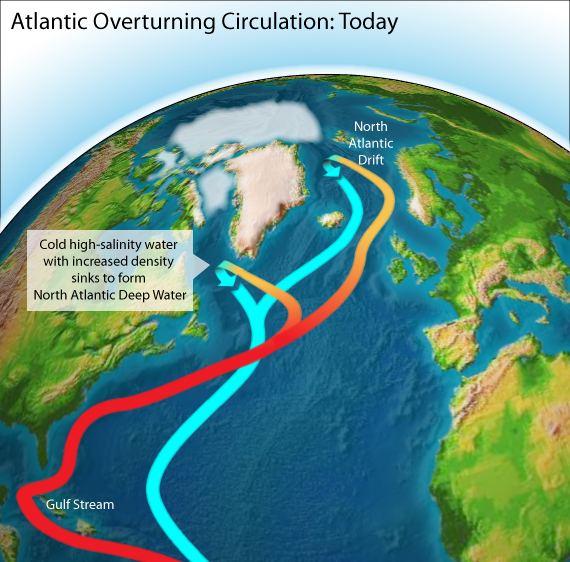 So long as this “global conveyor belt”—known to scientists as the Atlantic Meridional Overturning Circulation, or AMOC—keeps functioning, the Gulf Stream will also continue to bring warmer waters to the eastern United States and Europe. Should it be disrupted, however, the whole system might break down, in which case the Euro-Atlantic climate could turn colder and more storm-prone. Such a disruption might occur if the vast Greenland ice sheet melts in a significant way, as indeed is already beginning to happen today, pouring large quantities of salt-free fresh water into the Atlantic Ocean. Because of its lighter weight, this newly introduced water will remain close to the surface, preventing the submergence of salty water from the south and so effectively shutting down the conveyor belt. Indeed, exactly this process now seems to be underway. So far, the AMOC has not suffered a dramatic shutdown, but it is slowing, and scientists worry that a rapid increase in Greenland ice melt as the Arctic continues to warm will pour ever more meltwater into the North Atlantic, severely disrupting the conveyor system. That would, indeed, constitute a major tipping point, with severe consequences for Europe and eastern North America. Not only would Europe experience colder temperatures on an otherwise warmer planet, but coastal North America could witness higher sea levels than those predicted from climate change alone because the Gulf Stream tends to pull sea water away from the eastern United States and push it toward Europe. If it were to fail, rising sea levels could endanger cities like New York and Boston. Indeed, scientists discovered that just such a slowing of the AMOC helped produce a sea-level rise of four inches from New York to Newfoundland in 2009 and 2010. In its 2014 report on the status of global warming, the IPCC indicated that the likelihood of the AMOC’s collapsing before the end of this century remains relatively low. But some studies suggest that the conveyor system is already 15–20 percent below normal, with Greenland’s melting still in an early stage. Once that process switches into high gear, the potential for the sort of breakdown that was once science fiction starts to look all too real. Another crucial ecosystem that’s showing signs of heading toward an irreversible tipping point is the world’s constellation of coral reefs. Remarkably enough, although such reefs make up less than 1 percent of the Earth’s surface area, they house up to 25 percent of all marine life. They are, that is, essential for both the health of the oceans and of fishing communities, as well as of those who depend on fish for a significant part of their diet. According to one estimate, some 850 million people rely on coral reefs for their food security. Corals, which are colonies of tiny animals related to sea anemones, have proven highly sensitive to changes in the acidity and temperature of their surrounding waters, both of which are rising due to the absorption of excess carbon dioxide from the atmosphere. As a result, in a visually dramatic process called “bleaching,” coral populations have been dying out globally. According to a recent study by the Worldwide Fund for Nature, coral reef extent has declined by 50 percent in the last 30 years and all reefs could disappear as early as 2050 if current rates of ocean warming and acidification continue. In its report, the IPCC, whose analysis tends, if anything, to be on the conservative side of climate science, indicated that the Amazon faced a relatively low risk of dying out by 2100. However, a 2009 study conducted by Britain’s famed Meteorological (Met) Office suggests that the risk is far greater than previously assumed. Even if global temperatures were to be held to an increase of 2 degrees Celsius, the study notes, as much as 40 percent of the Amazon would perish within a century; with 3 degrees of warming, up to 75 percent would vanish; and with 4 degrees, 85 percent would die. “The forest as we know it would effectively be gone,” said Met researcher Vicky Pope.